‘Synaesthesia is a harmless neurological condition in which a stimulus in one sense can spark a perception in another – for example, listening to music might cause a synaesthete to literally see colours. Most people don’t have synaesthesia, but we do make links across the senses, so, for most, high-pitched notes ‘go with’ the taste of lemon better than they do the taste of cinnamon. These kinds of associations, cross-modal correspondences, are not necessarily experienced at a conscious level, but when I first met Director and Artist Steph Singer she was looking at bringing those cross-modal correspondences into conscious awareness in the context of a performance of a Debussy quartet. ‘I met her and some of the other members of BitterSuite in the basement of the Rich Mix in London, and we chatted for several hours about the research on cross-modal correspondences and synaesthesia, and how it might be meaningfully incorporated into an musical and artistic experience. ‘A few months later, I got to experience one of the performances for myself. It was strange, bewildering, profoundly moving – and my first realisation that I, personally, could use my scientific research to create art. 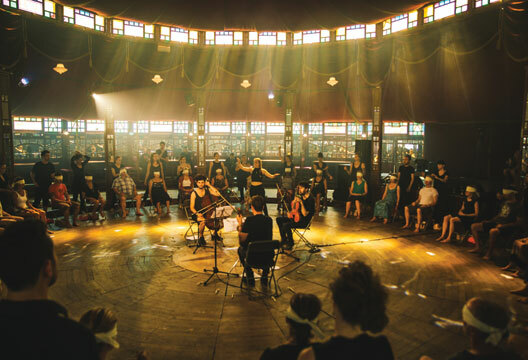 ‘BitterSuite springs from a motivation to take classical music audiences out of their mind to experience an embodied state of listening. Psychology contains a wealth of inspired research on synaesthesia and cross-modality. Clare was my link to this world, uncovering truths and explaining dense academic ideas. She introduced me to key articles that became my foundation in thinking about how the senses interrelate to deepen the experience of the primary sensory modality. Find out more, including upcoming concerts and a Kickstarter campaign.